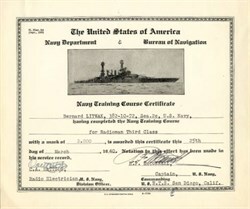 Certificate from the Navy Training Course Certificate issued in 1940. This historic document was printed by U.S. Government Printing Office and has an ornate border around it with a vignette of an early battleship. This item is hand signed by the Radio Electrician Division Officer, C.A. Mattson and Captain U.S. Navy Commanding USNTC San Diego, R.F. McConnell and is over 64 years old. The certificate was issued to Bernard Litwak.